Originally debuted in London in 2012. Mary McCann and Lisa Joyce in Our New Girl. Photo by Kevin Thomas Garcia. 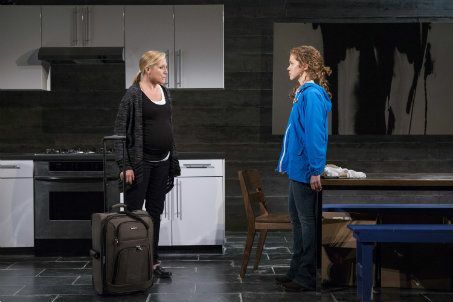 BOTTOM LINE: This suspenseful play is riveting from start to finish. A creepy little boy who seems to be disturbed, a young, pretty nanny who has her sights set on seducing the husband, and a mother on the brink of losing her mind -- these are frequently the standard ingredients of thrillers, both in film and theater. While Atlantic Theater Company’s production of Our New Girl, (which had its premiered in London two years ago) includes all of these ingredients and seems to be a work of mystery and suspense that is barreling along into a revealing resolution. It turns out to be much more than a mystery for us to solve, showing us four characters who are trapped in their lives and what they will do to find and experience freedom. The play opens with the unexpected arrival of Annie (Lisa Joyce) at Hazel's (Mary McCann) door. Hazel’s husband Richard (CJ Wilson), who is out of the country doing pro bono surgeries for earthquake victims in Haiti, arranged for Annie to work as a nanny in their home without notifying Hazel, who is pregnant with their second child and becoming further physically encumbered. Hazel is livid and wants Annie out of her home as soon as possible, but after arguing that she cannot handle a nanny because she is too busy, she hears the lack of logic in her argument and lets Annie stay. While their interactions are mostly positive at first, Annie shows herself to be more of a mother figure than Hazel, often telling both Hazel and her son what is best for children. We soon learn that Hazel abandoned a successful career as a lawyer to be a full time mother to her son Daniel (Henry Kelemen) and soon-to-be-born daughter, inspired by a beautiful mother she met during a trip to Italy. To try to regain some of the rush she felt as a career woman, she is trying to import Italian olive oil and the house is filled with stacks and boxes of the golden liquid. Hazel has begun to realize that she is incapable of handling an import business and the bottles that clutter the house seem to add further to her feelings of being trapped. When Richard returns home from Haiti, Annie is clearly in awe of this globe-hopping surgeon and begins to endlessly dote upon him. As a poor Irish farm girl, Annie envies the lives of London’s upper class and wishes she had Hazel’s life. Annie begins taking on the role of a mother further, pushing Hazel out when it comes to dealing with Daniel’s worrisome behavior at school. The play’s real mystery is who will be the truly disturbed one, and Hazel, Annie, and Daniel all seem to be contenders. The play is really about four unhappy people looking for an escape route: A mother who doesn’t want to be a mother but is too deeply enmeshed to abandon ship, a husband who uses international charity work to escape dealing with his wife and child, a son who is neglected emotionally by his parents, and a poor Irish girl looking for a way out of a life of simplicity and poverty. I found this production to be riveting from start to finish, and I didn’t want the show to end. Part of the production’s ability to be thoroughly engrossing is due to a very authentically designed set. Designer Timothy R. Mackabee evokes the feel of a well-to-do London home: an elaborate kitchen offset by a dining table and large abstract painting. The kitchen window even lights up with authentic seeming sunlight and reflects the time of day of each scene. The actors are also convincing in their roles. McCann is especially impressive as Hazel as she captures one woman’s psychological unraveling. Joyce and McCann play off each other well and create palpable tension in each of their scenes together. This production of Our New Girl is one that will hold your interest from start to finish.